Forget Me Not When Far Away is the latest work in playwright Kira Obolensky's residency with Ten Thousand Things Theater. As the play begins, an unnamed country has been at war for ten years, and in a town far from the fighting, all of the men are long gone. The women have learned to keep the town running, from bartending to dentistry to petty government bureaucracy. As the women are going about their daily business, including a reading of the latest casualties of the war, a man limps into town. Dressed in fatigues and looking exhausted, John Ploughman (Ron Menzel) is returning to a place much changed in the years he has been gone. He finds that he has been reported dead, and sets out to resolve that issue while searching for a woman he treated badly before he left. There's really not much to the story itself, but it's a fascinating tale of the after-effects of long-term war. It's also very funny, due in large part to the five women who play more than 20 characters. Highlights include Shá Cage as a woman who sets her sights on her former classmate John, Karen Wiese-Thompson as a dentist, Annie Enneking as a government functionary, Sun Mee Chomet as the woman John left behind, and Elise Langer as Atlas, the son John didn't know he had. Menzel does a great job interacting with all of these sometimes-extreme characters and hinting at a deeper level of his own character. 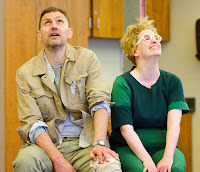 Ron Menzel with Elise Langer as Atlas. Everyone in this show is terrific! Every one of the multiple characters has a distinct personality and outlook, along with a look created with minimal costume changes and an array of wonderfully terrible wigs. Normally, I'm a fan of realistic wigs (shout out to Penumbra Theater for the wonderful wigs in By the Way, Meet Vera Stark and Detroit '67.) Given Ten Thousand Things' minimalist aesthetic, 20-some realistic wigs are not an option, and going in the exact opposite direction fits this play perfectly. 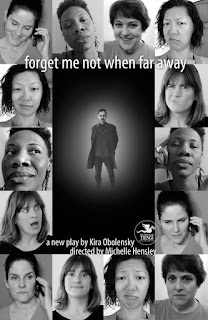 Forget Me Not When Far Away does everything a good play should do. It elicits laughs and sincere emotions through exaggerated but recognizable characterizations. 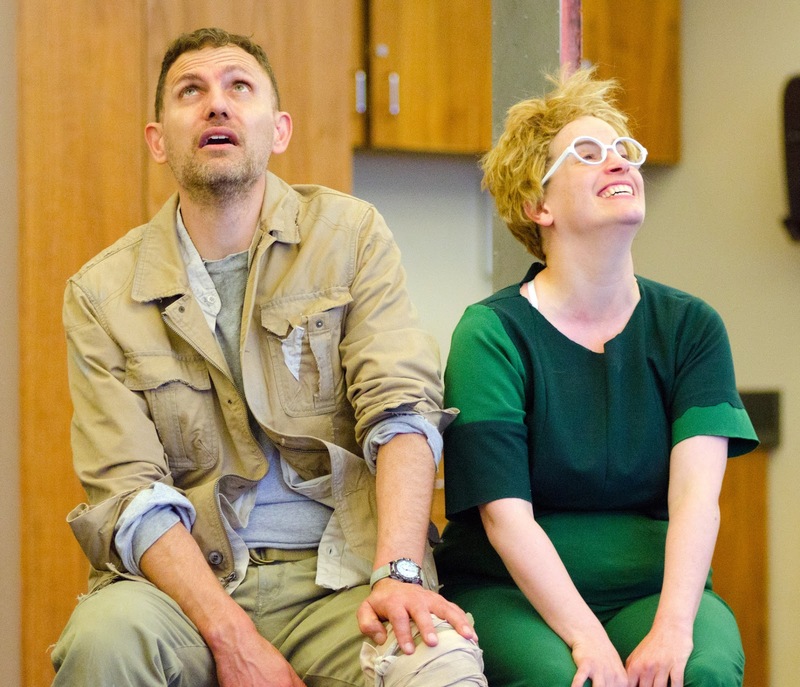 Obolensky's script, under Michelle Hensley's sure direction, is a wonderful example of the work that can come out of long-term residencies, and helps to explain why so many playwrights call the Twin Cities home. You can still catch this show through May 31 at Open Book. See it if you can. Which is advice I'd give about anything this company puts on. Side note from Carly (other contributor) to TTT: I NEED a copy of the picture of Atlas that was on his mother's desk. It still makes me laugh to think of that dang picture, and it's been weeks since we saw the show.